Update 411. 90047 on the Virgin set & 47727 on the Boston steel. The evenings are getting lighter and the plan was to see the Class 47 at Nuneaton, hopefully with enough light for a reasonable photo. Didn’t go the “quick” way, but via Birmingham International to see 90047 on the Virgin loco-hauled set. The Class 90 was seen in both directions before continuing to Nuneaton. 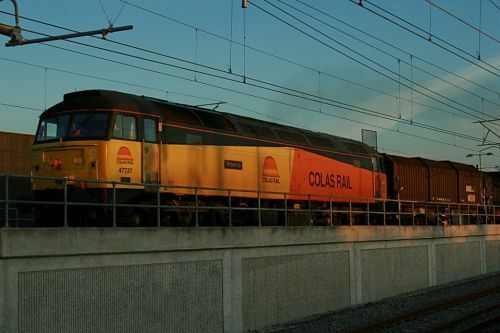 Several other freights were seen with Class 86 electrics making a change from Class 66s. Fortunately the 47 was running to time as the Nuneaton “dodger” is only an hourly service and due to depart soon after the steel train was booked through. This entry was posted in Sharpo's World Photo Updates on January 25, 2011 by Sharpo.